The natural lenses of our eyes should be clear. This allows for them to refract (bend) the rays of light that come into the eye, letting us see. If you suffer from cataracts, you will endure hazy vision due to the clouding of the lenses. Cataracts make everything you see appear blurry and less colourful. Cataract surgery is available to deal with this condition, but approximately 20% of patients develop haze on the membrane behind the lens after their operation. This leaves their vision diminished and is called posterior capsule opacity. In order to correct this problem, the YAG Posterior Capsulotomy procedure was created. What is the YAG Posterior Capsulotomy procedure? The YAG Posterior Capsulotomy procedure is a post-cataract surgery laser procedure done so that you can see more clearly. During cataract surgery, your natural lens is replaced by an intraocular lens. As aforementioned, 20% of the time, the intraocular lens becomes cloudy, so post-cataract surgery is needed. Post-cataract surgery, also known as YAG Posterior Capsulotomy laser capsulotomy, is performed to create an opening in the cloudy capsule that lies behind the intraocular implant. The opening allows you to see better, and the cloudiness is reduced if not gone entirely. Your eye surgeon will perform the YAG Posterior Capsulotomy procedure at an outpatient clinic or in their own office. First, your eyes will be numbed by drops so you don’t feel any pain (and to enlarge the pupils). Then, a special contact lens is fit to your eye, which helps direct the laser’s high-energy light beams behind the intraocular lens and into the capsule. The laser makes an opening in the capsule and you’re done. Why is this procedure now the preferred method to follow cataract surgery? People who have undergone cataract surgery report that they see a glare and have other vision issues. The YAG Posterior Capsulotomy procedure reduces glare and improves vision by letting light pass through the cloudy regions of the lens capsule. Furthermore, the YAG Posterior Capsulotomy procedure takes about five minutes to complete and besides a few brief flashes of light from the laser, you do not feel any pain. Post-surgery, your vision may be blurred, but this generally clears within 1-2 hours. Some people experience “floaters” for a few weeks after YAG Posterior Capsulotomy; however, this isn’t a cause for concern. 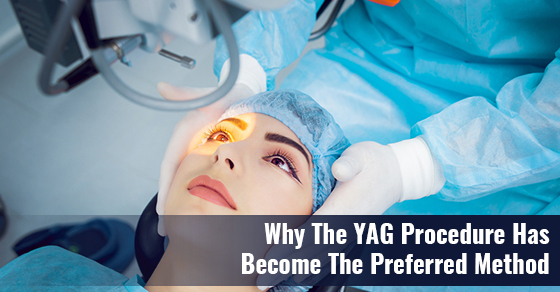 Additionally, eye surgeons prefer the YAG Posterior Capsulotomy procedure because it is easier on the patient and requires little aftercare. In the five days that follow your procedure, you will be prescribed eye drops that need to be administered four time daily. Finally, patients do not need to wear an eye patch after YAG Posterior Capsulotomy and are able to resume their day-to-day activities immediately afterwards.